« 22.3 It’s called contrast, baby! My 2nd week I wrote out notes as I went along and then tuesday happened then wednesday and no I didn’t post. And then another week went by. So this is my 2nd week of doing the fifteen minute challenge. Fifteen minutes per day of sewing minimum to keep me accountable. I am focusing still on my one quilt, the exothermic quilt. Tuesday Jan 24, sewing with a friend. This is the first such sewing days in one week and it’s always great to do! This friend has gone through a lot in the last two months & it was great to be able to spend time with her. In addition, I finished my 14th of my 14 side blocks for my quilt. Also worked on prepping the 4 corner blocks & started sewing down on them. Wednesday, I couldn’t stop until I finished the corner blocks. Thursday, was ripping out paper of the blocks I had finished in the week before. Ripping paper at lunch, at 2nd break, and at home. Friday, was also ripping paper until all the paper was ripped out. My blocks are paper free. Saturday, the only day I worked on something else. I was asked about handwork for a small group that just joined my guild. I took my hexagon quilt and had to resew a couple of pieces together and then pin the thing down to the white background. Sunday, I cut some new sashing strips that are just a little bit wider than I intended. With my design wall, I decided I liked the slightly wider sashing’s effect. Not too much wider, but a little. 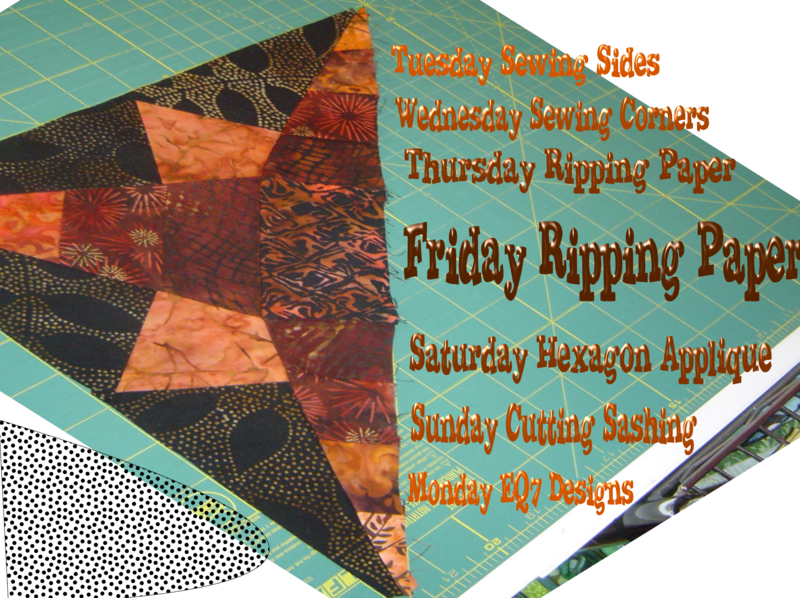 Monday, not quilting exactly, but I opened up EQ7 and started to look at some new designs based off the block a day calendar I have. If you want to see what others are doing for their 15 minutes, look at Life in Pieces blog. A very busy and productive week. I think you should get extra credit for ripping paper for two days. That is probably my all time least favorite quilting activity. Hope this next week is a productive one too. Thanks for linking up this week. glad that you got so much done. What a great week! Anything quilt related counts. Wow. I’m in awe of your crafty week. Ripping paper is so not one of my favourite things so I’m doing a fist pump for you on that score. Luckily the paper I ripped wasn’t covering the whole block, but still each side block had two paper pieced section in it. SO glad I’m not doing my original design there otherwise I’d still be sewing the 5th block together instead of ripping paper out of them all.